It was definitely hot this past Sunday at the Suffolk County Gluten Free Vendor Fair, so it was nice to take a break from all of the baked goods and enjoy a refreshing sample of Gaga's Sherbetter. Gaga's Sherbetter is a cross between ice cream and sherbet. It is all natural and contains no artificial flavors, preservatives, or sweeteners and, of course, it is gluten free. Currently, their product line includes 5 flavors: lemon, raspberry, rainbow, orange, and chocolate. With the exception of rainbow, all flavors are also available in sticks as opposed to just in pints. If you are looking for a cold and tasty treat on a hot day, Gaga's Sherbetter should be a top choice! It is currently available in 27 states including AL, AK, CT, FL, GA, IL, IN, KY, LA, MA, MD, ME, MI, MS, NC, NH, NJ, NY, OH, PA, RI, SC, TN, VA, VT, WI, WV, and in Washington DC. It is also available to order online at www.icecreamsource.com. For more information, visit their website at www.gonegaga.net. One of the brands at the Suffolk County Gluten Free Vendor Fair that I was previously unfamiliar with was Katz Gluten Free Bake Shop. For those of you that attended, they were the super generous ones who handed out sample bags to fill with all of their cookies and breads! Katz's motto is "Gluten-Free Should Not Be Taste Free!" and they definitely make sure their products taste stellar. All of the products besides being gluten free are dairy free, nut free, and kosher. Their Challah Rolls won the "Best Baked Goods" Award in the Breads, Grains, and Cereal category at the Kosherfest '08 New Products Competition! And even better their products are made in a facility that is certified gluten free by the Gluten Free Certification Organization (a division of the Gluten Intolerance Group). For more information, visit their website at www.katzglutenfree.com or call their consumer phone line at 845-519-1555. To those of you who read my latest press release or who follow me on Twitter (www.twitter.com/msceliacsays), then you know that I have spoken about an upcoming contest. Well, the time to reveal the contest details has finally arrived! Starting as of now, I am asking my visitors to submit to me an email (don't forget your name) with their favorite gluten free restaurant and their favorite gluten free product. The restaurant you select can either have a gluten free menu, be entirely gluten free, or is extremely knowledgeable in gluten free dining. At the end of the contest, I will compile the list and post it to the website. Winners will randomly be selected from the emails sent to me at msceliacsays@gmail.com. Each person is only to submit 1 restaurant and 1 product. Multiple submissions will make your entry invalid. The winners will receive gluten free brown rice pasta from Tinkyada Pasta. I've mentioned Tinkyada Pasta on this site several times as it is a favorite of mine and most everyone I know in the Celiac community! I also wanted to let everyone know about a bill that is being introduced to recognize the month of May as National Celiac Awareness Month. For more information and to find out how you can support this bill, visit the American Celiac Disease Alliance's website by clicking here: American Celiac Disease Alliance. So, don't forget...Send an email to MsCeliacSays@gmail.com with your name + your favorite gluten free restaurant + your favorite gluten free product and you may be chosen to win some delicious Tinkyada Pasta. The contest will run through May 12th at 7 PM EST. Elisabeth Hasselbeck Borders Book Signing - May 7th! For those of you who haven't heard, Elisabeth Hasselbeck will be releasing The G Free Diet: A Gluten Free Survival Guide next week! To celebrate the release of her latest endeavor, she will be discussing and signing her book at Borders Park Avenue (and 57th St.) in NYC on Thursday, May 7th at 7 PM. This event is free and open to the public. Seating will be first-come, first-serve. Hope to see everyone at the signing next week! Foods By George Is A Gluten Free Classic! When I first started on a gluten free diet, there were not nearly as many brands around as there are today. 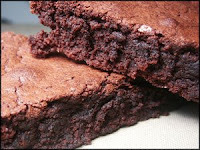 One of the first gluten free products that I truly enjoyed were brownies from the brand, Foods By George. Foods By George was at the Suffolk County Gluten Free Vendor Fair this weekend giving out samples of their brownies and they still remain one of the best gluten free products around. Since 1991, Foods By George has been making gluten free foods. The products are made in a 100% gluten free facility. George, who has created all of the recipes, is a graduate from the Culinary Institute of America. Their products are sold at various health food stores in the Frozen Food Section. In NYC, they are available at Whole Foods Markets. You may also order Foods By George products at their website at www.foodsbygeorge.com. I'm Back From The Fair! Yesterday was the 3rd Annual Suffolk County Gluten Free Vendor Fair and it was a blast! There were tons of gluten free vendors giving out so many delicious samples and a lot of the vendors were also selling their products at the fair! Although it was definitely very crowded as each year there seems to be more and more people, it was completely worth making your way through the masses of people. This week on Ms. Celiac Says...I'm going to exclusively feature tasty products from brands that were at the fair. I purchased so many great gluten free products from brands that I know and love and new brands that may become future favorites of mine! I was also able to bring home so many wonderful samples! When stopping by the Whole Foods booth, I learned that Whole Foods Gluten Free Bakehouse will soon be releasing a gluten free chocolate cupcake with chocolate icing and a gluten free vanilla cupcake with vanilla icing. I was able to sample them and they were delicious (photographed above). I am definitely looking forward to seeing these in stores. With the exception of the products noted, these products are available at Whole Foods Markets everywhere! For more information, please visit, www.wholefoodsmarket.com. Weekend Update - Twitter Time! I hope you're all outside enjoying the beautiful weather (if you're in New York, at least). I wanted to let you know that Ms. Celiac Says is now on the social networking site, Twitter. Please check us out and follow us at www.twitter.com/msceliacsays. It is a great way to stay updated instantly on all of the latest gluten free news. Also, as another reminder, the Suffolk County Vendor Fair takes place tomorrow, Sunday, April 26th, 2009. It starts at 11 AM and will go until 4 PM. The cost is $10 cash at the door. There will be over 50 gluten free vendors along with Dr. Peter Green of the Celiac Disease Center at Columbia University and Cynthia Kupper who is a registered dietitian and director of the Gluten Intolerance Group. For more information, please visit www.suffolkcountyceliacs.org/events.html. Enjoy your weekend and for those of you who are not going to be able to attend the Suffolk County Gluten Free Vendor Fair this weekend, I will be letting you know everything that happened at the fair on Monday in the day's post. I absolutely love rice from Lundberg Family Farms. They have so many delicious varieties of gluten free rice and rice products and the brand has been around since 1937! 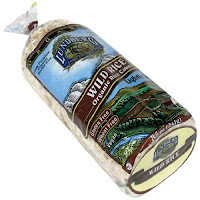 Their gluten free product line includes organic rice, eco-farmed rice, rice flour, rice chips, organic rice cakes, eco-farmed rice cakes, rice syrups, risottos, rice pasta, and hot cereal. *Products by Lundberg Family Farms are available in stores everywhere. For more information, please visit www.lundberg.com. *Lundberg products are also available at Ms. Celiac's Market. ***I hope everyone has a great weekend and please do not forget to check out the Suffolk County Gluten Free Vendor Fair! It's sure to be a great event! Food Can Be Great Without Dangerous Grains! If you have never heard of The Grainless Baker then you are truly missing out on some tasty gluten free products! The Grainless Baker makes everything from breads to pizzas to cookies to cakes to muffins to danishes to pies, etc. In other words, they have a huge selection of gluten free products! The Grainless Baker's Products are available at stores / restaurants in Idaho, Montana, Texas, Missouri, Indiana, Nebraska, Kansas, Illinois, Ohio, Florida, Georgia, North Carolina, Virginia, Maryland, Delaware, New Jersey, Pennsylvania, New York, Connecticut, Rhode Island, New Hampshire, and Massachusetts. You may also order the products at their website at www.thegrainlessbaker.com. The Grainless Baker will be at the Suffolk County Vendor Fair on Sunday, April 26th! Recently, I tried a restaurant called Nizza in NYC's Hell's Kitchen area. The cuisine is inspired by foods of the French and Italian Riviera, as "Nizza" is the Italian pronunciation of the French city, Nice. Nizza recently added a gluten free menu that includes a wide range of soups and salads, a dish called socca and several varieties of it, corn pasta dishes, risotto, meats, poultry, and fish. I ordered for my dinner, an Arugula Salad with Parmesan, Lemon, and Olive Oil to start with the Classic Socca with Sage, Onions, and Pecorino for my main course. They were both absolutely delicious! Nizza is open for lunch Monday - Friday and for brunch on Saturday and Sunday. It is open for dinner, 7 days a week. View Co-Host To Release Gluten Free Survival Guide! 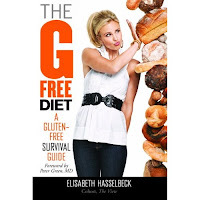 On Monday, May 4th, 2009, Elisabeth Hasselbeck (co-host of the View) will be releasing The G Free Diet: A Gluten-Free Survival Guide. For years, Elisabeth Hasselbeck couldn't figure out what was making her sick. She asked doctors and consulted nutritionists, but no one seemed to have any answers. It wasn't until spending time in the Australian Outback, living off the land on the grueling Survivor TV show, that, ironically, her symptoms vanished. Returning home, she pinpointed the food that made her sick -- gluten, the binding element in wheat. By simply eliminating it from her diet, she was able to enjoy a completely normal, healthy life. But that wasn't all. Hasselbeck discovered the myriad benefits that anyone can enjoy from a gluten-free diet: from weight loss and increased energy to even the alleviation of the conditions of autism. In this all-inclusive book, Hasselbeck shares her hard-earned wisdom on living life without gluten and loving it. She gives you everything you need to know to start living a gluten-free life, from defining gluten - where to find it, how to read food labels - to targeting gluten-free products, creating G-Free shopping lists, sharing recipes, and managing G-Free living with family and friends. The G Free Diet will also include a forward from famed Celiac Disease doctor and my doctor, Peter Green, MD. This book will be published by Center Street, a division of the Hachette Book Group and will retail for $24.99. 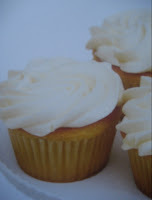 However, it will be on sale through Amazon.com and available for the great price of $16.49 at Ms. Celiac's Market. It seems like May will be a great month for those of us on a gluten free diet with both the release of Elisabeth Hasselbeck's book and the debut of Starbuck's gluten free Orange Valencia Cake. Recently, I was shopping at Whole Foods and noticed a new package in the gluten free cookie section of the aisle. It was a brand called Curious Cookie. They had gluten free cookies available in 4 flavors. Their cookies are not only gluten free but lactose and casein free, as well as, being very low in cholesterol. The gluten free flour used to make these cookies is a combination of all natural rice flour with all natural soy flour and all natural tapioca flour along with a hint of xanthan gum. Currently, you may purchase these cookies at their website www.curiouscookie.com or visit their retail location in Pompton Lakes, New Jersey. The cookies are also available at Whole Foods Markets. I have more details on the gluten free cake Starbucks will be offering starting Tuesday, May 5th, 2009. According to the Starbucks Official Blog, the Orange Valencia Cake "is a delicious moist citrus cake bursting with Valencia oranges and topped with crunchy almonds." 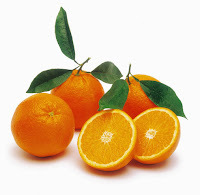 Another added benefit, is that it will provide you with 30% of your daily value of Vitamin C.
You will find the Orange Valencia Cake with Almonds in the Pastry Case with a sign that reads, "Gluten Free." Each cake will be individually wrapped to prevent cross-contamination. The complete ingredient list will be on each package so you can find out exactly what you are eating. Stay Tuned to Ms. Celiac Says...for the latest news about gluten free developments at Starbucks! For the 1st time in quite a few years, I received a chocolate bunny for Easter. It was gluten free, of course! 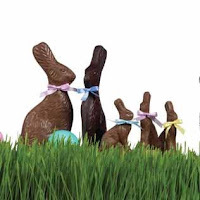 The bunny was solid dark chocolate and from a chocolate company called Bissinger's. Bissinger's is one of the last handcrafted chocolatiers in the world. They have been making their fine French confections for more than 350 years! The Bissinger family began creating their delicacies for European royalty in 17th-century Paris, France. Karl Bissinger left France in 1845 for Cincinnati, Ohio. In 1927, his son opened the 1st Bissinger shop in Saint Louis on McPherson Avenue. That store closed in 2007, but a replica will be rebuilt soon in the popular City Museum in Saint Louis, Missouri. Most of Bissinger's chocolates are gluten free and they have a huge selection of chocolates to choose from. Currently, they have "Economic Relief Packages" where you can buy any 5 items in this category and receive 3 FREE or buy any 2 and receive 1 FREE! For more information on which products are gluten free, feel free to contact them at orders@bissingers.com or at 1-800-325-8881 or visit their website at www.bissingers.com. I wanted to take a moment to thank everyone for the tremendous flow of support we have received! Ms. Celiac Says...has made it to its 4th month of posting the latest and greatest gluten free products and restaurants and today is our 100th post! Thank you to all of our loyal readers! Ms. Celiac Says...is nothing without you! I also wanted to remind everyone that coming up this SUNDAY, APRIL 26th is the 3rd ANNUAL SUFFOLK COUNTY GLUTEN FREE VENDOR FAIR! I have been to this event the past two years and it is a lovely and delicious experience. You will not leave hungry! It is actually the largest gluten-free consumer event in North America and over 50 vendors will be present this year! Miller's Gluten Free Bread Co. I will definitely be attending the fair this weekend, and will keep you updated on the latest delectable gluten free products that I get to sample. BREAKING NEWS - STARBUCKS TO PREMIERE GLUTEN FREE CAKE! On Tuesday, May 5th, 2009, Starbucks will introduce their 1st gluten free product in US stores, a pastry called Valencia Orange Cake. This cake will be made with 7 ingredients which are 100% gluten free! The gluten free cakes will be individually wrapped and will sell for $2.25. Adrienne Knapp, a product manager at Starbucks, said, "I think one of the things we learned right from the get-go from our gluten-free customers is they can't eat away from home very easily. A cake is actually really hard to find for someone that's a gluten-free consumer." Starbucks - I LOVE YOU! If I ever decide to move to Paris, I can assure you that one of the top reasons would be for the macarons at Ladurée . I could seriously get by eating these for breakfast, lunch, and dinner, along with a shot of espresso. And with so many delicious flavors to choose from, one can never get bored! They also have locations in England, Monaco, Switzerland, and Japan. For more information, please visit their website at www.laduree.fr. 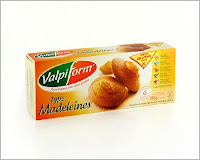 For those of you that decide to visit stores such as Naturalia, La Vie Claire, and Biocoop while in Paris, you will find a popular brand of gluten free products called Valpiform. Valpiform makes over 60 gluten free products including breads, crackers, baking mixes, pasta, biscuits, pizza crusts, puff pastries, etc. A large percentage of their products are also milk free, egg free, soy free, and peanut free. Some products are also free of lactose and organic. All of their products comply with CODEX standards. These products are available throughout most of Europe. Check Out The Food Shoppes! When traveling on a gluten free diet, I always recommend bringing some gluten free products with you. Even when you know there will be gluten free cuisine where you're visiting, it is better to be safe than sorry (or hungry!). However, it is always fun to check out the natural food markets in another country to try their selection of gluten free products. In Paris, there are many places to try. Three great shoppes are Naturalia, La Vie Claire, and Bicoop. Whenever, I am abroad and I find a gluten free product that I love, I will buy as many as can fit into my suitcase for when I return to the states. So Many Restaurants To Try! Every time that I have traveled to Paris, France on a gluten free diet I have been amazed at how easy it is for me to find delicious food to eat. It seems like as soon as I show my dietary card to a waiter, they completely understand what gluten is and are able to bring me a gluten free yet flavorful meal to enjoy! Although, I have tried many restaurants in Paris some of my favorites include La Cantine Du Faubourg, Buddha Bar, and L'Obelisque at the Hotel de Crillon. These places catered exceptionally well to my diet. La Cantine du Faubourg is a beautifully designed trendy restaurant at 105 rue du Faubourg Saint Honore. It has a variety of French cuisine with an Asian-influence. This restaurant serves lunch Monday thru Friday and dinner seven nights a week. As it gets later in the night, this restaurant turns into a lounge. They also provide a free car service home to their diners. For more information visit their website at www.lacantine.com. Buddha Bar is also a very cool looking place with amber-colored lighting and rich mahogany furniture. The cuisine is a combination of Chinese and Japanese dishes. The Buddha Bar is a chain that is in many major cities throughout the world. 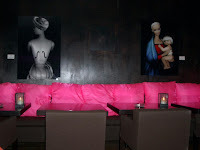 For more information, visit their website at www.buddha-bar.com. Now, the Hotel de Crillon is my favorite hotel in Paris, France and one of their more casual restaurants is called, L'Obelisque. This serves some traditional French cuisine. However, the chef is very aware of the needs of someone on a gluten free diet and is able to provide some excellent gluten free options. 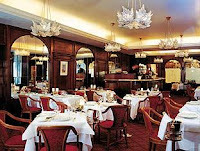 For more information, visit www.crillon.com. The first time I visited France on a gluten free diet, I was extremely nervous. I was worried that I would not be able to communicate my restrictive diet in French. I had a difficult enough time trying to explain it in English to an English-speaking server. However, I did some research online and found a company called www.dietarycard.com. This company provides small green cards that can easily fit into your wallet or pocket and are very durable (I've had mine for about 8 years). And it is a life-saver as far as communicating your dietary needs. On their website, you are able to order the classic Celiac card or a custom-made card that is specific to your diet whether it includes food allergies or that you're on a vegan diet. The card is available in 18 languages including: English, French, German, Hungarian, Italian, Polish, Portuguese, Romanian, Spanish, Arabic, Bulgarian, Chinese, Czech, Greek, Japanese, Russian, Thai, and Turkish. You can order one card for approximately $9 or the classic europack for $30 or the worldwide pack for $37. For more information, visit their website at www.dietarycard.com or email them at enq@dietarycard.co.uk. Weekend Update - Happy Easter / Passover! I feel like it's been a while since I've had a weekend update and I wanted to take a few minutes to share with you some gluten free goodness! In the past 2 weeks, two primetime TV shows have featured gluten free products. On March 26th, 2009, ABC's Private Practice aired an episode in which Violet Turner (Amy Brenneman) could be seen eating a bag of gluten free pretzels by Ener-G brand. This week, on the CW's 90210 they actually work gluten free bread into the storyline and name it as a great reason to stay living in Los Angeles instead of returning to their hometown of Kansas. On Thursday night, I had dinner at a fabulous restaurant in NYC's Times Square that has recently added a gluten free menu. It is a French-Italian restaurant called Nizza. They have a great selection of choices on their gluten free menu. I had a dish called Socca, which is a piece of flat bread made out of chickpea flour topped with sage, onions, and parmesan cheese with an arugula salad to start. I will describe the restaurant in more detail with some pictures of the food in an upcoming post. I also wanted to thank all of the loyal visitors of Ms. Celiac Says. In just 3 months, this site has grown tremendously! And of course, none of this would be possible without the delicious products from our favorite brands and the restaurants that cater to gluten free diners. These brands/restaurants will be listed at the end of this post along with a link to their websites. I would like to especially thank Applegate Farms, who sent me some of their delicious gluten free chicken nuggets and I would also like to thank Arico Foods for sending me their unbelievably addictive cassava chips, and a fine selection of cookies, coupons, and a t-shirt! This upcoming week, Ms. Celiac Says...will be featuring the restaurants and products of Paris, France and be sure to stay tuned for exclusive gluten free giveaways coming soon! Today I will be enjoying a gluten free Passover Cake from Shabtai Gourmet for Easter lunch. In an upcoming post, I will let you all know how it was! I literally went into a panic when I was reading the ingredients to my Cadbury Creme egg and noticed the word "wheat" clearly stated on the packaging. How could my absolute favorite candy in the world contain gluten?! I was strongly considering ignoring that I had seen those words and continuing eating the egg. However, after I had a nightmare about eating gluten that same night, I decided that I better look into its gluten free status. It turns out Cadbury Creme Eggs do contain an ingredient called glucose syrup which can sometimes be derived from wheat. However, glucose syrup derived from wheat is actually considered to be gluten free. In the UK, Cadbury states on its website that the Cadbury Creme Eggs are gluten free. In the United States, however, Hershey's manufactures Cadbury products and will not state the gluten status of the Cadbury Creme Eggs even though the ingredients are supposedly the same for the UK and the US egg. I have lived on Cadbury Creme eggs and never have had a bad reaction. I have also discussed this with my doctor and several nutritionists who all assured me that it was safe to eat this product. However, it is your choice to make. To learn more about why wheat-derived glucose syrup is considered gluten free, check out this article at the Sure Foods Living website. And for more information regarding Cadbury products, visit their website at www.cadbury.com. Another delicious gluten free Easter-time candy are Just Born's Marshmallow Peeps. Nowadays, Peeps are available in a variety of colors and shapes. For Spring, you can get Tulips (Yellow), Chicks (Yellow, Pink, Lavender, Blue, Green, and Orange), and Bunnies (Yellow, Pink, Lavender, Blue, and Green). The yellow chick is also available sugar-free. My personal favorite is the original yellow chick. For some reason, it just tastes the best! 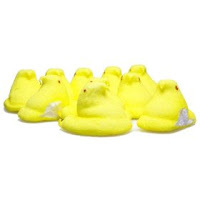 For more information on marshmallow peeps, you can visit their website at www.marshmallowpeeps.com. Both Cadbury Creme Eggs and Just Born Marshmallow Peeps are available for sale at Ms. Celiac's Market! Be Jolly with Jelly Belly! I must say that I was never a fan of jelly beans until I went on a gluten free diet and found out that Jelly Belly makes them gluten free! Now, I love them! There was a time when you had to be careful about the flavors that you were eating because the Buttered Popcorn flavor contained gluten, but now the ingredients have been altered so that all Jelly Belly Jelly Beans are gluten free. As with any product, it is a good idea to double-check this information with the company as the gluten free status can change day-by-day. For more information about Jelly Belly Jelly Beans and other Jelly Belly products, please visit their website at www.jellybelly.com. 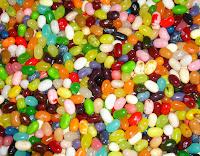 You may also purchase Jelly Belly Jelly Beans at Ms. Celiac's Market and at most food retailers. One of the reasons I love this time of year is that there is an abundance of gluten free products to be found as many kosher for Passover products are gluten free. I also love that Shabtai Gourmet's delicious line of cookies and cakes become available via FreshDirect! In January, I featured Shabtai Gourmet on my site. If you have not had the chance to try these products, you must do so now. 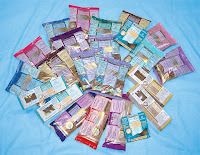 They are some of the best gluten free treats, I have ever had! Not only are their products kosher for Passover but they are made in a dedicated gluten free bakery and are casein free, corn free, dairy free, lactose free, and soy free. Shabtai Gourmet products are also available in the Passover section of many supermarkets including The Food Emporium in NYC. 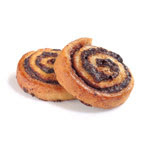 For more information or to order their products, please visit their website at www.shabtai-gourmet.com. One of the first gluten free snacks that I had once going on a strict gluten free diet were Jennie's Macaroons. My nutritionist had recommended these to me as they are known to be great for immune-compromised individuals. These tasty treats have 7 grams of lauric acid plus they are anti-microbial, anti-bacterial, anti-viral, lactose free, gluten free, sulfite free, wheat free, and contain no trans fats. 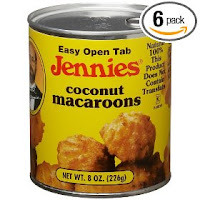 Jennie's Macaroons are also a great source of MCTs (Medium-Chain Triglycerides) and contain 100% unsweetened coconut. The 8 oz. cans of Traditional Jennie's Macaroons are kosher for Passover and available at Ms. Celiac's Market. Jennie's Macaroons are also available at most health food stores. 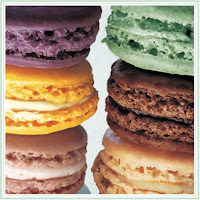 For more information, visit their website at www.macaroonking.com. Make Sure To Eat Your Matzoh! When I was younger, I use to eat a matzoh everyday for lunch. I never topped it with anything or got any of the flavored varieties, I just ate it plain and I loved it. Unfortunately, once I was diagnosed with Celiac Disease I had to say goodbye for a time to eating matzohs. Recently, I found out about a gluten free oat matzoh made by Lakewood Matzoh. These are a great alternative choice for those of you who miss having your matzohs for Passover. Lakewood Matzoh uses gluten free oats that are grown, cleaned, and ground in a completely gluten free environment. These oats also received orthodox rabbinical supervision at harvesting, de hulling, cleaning, and grinding. Therefore, Lakewood's Gluten Free Oat Matzohs are Kosher for Passover. These matzohs cost $23 for a box of three round shmurah (handmade) matzohs. You may purchase them at their website at Lakewood Matzoh. The only ingredients that they contain are gluten free oat flour and water. The Best Brazilian Cheese Bread!